If you are searching for OnePlus 3/3T A3003 FRP Unlock Process Without Using Computer or Flash Tool, How To Remove FRP Android 7.0 Nougat On OnePlus 3/3T A3003, One Plus 3/3T FRP Remove Google Account Bypass, How to Bypass Frp Lock On OnePlus 3T Android 6.0 Marshmallow and Android 7.0 Nougat Without Using Computer, One Plus 3T A3003 Remove FRP Google Account Android 7, One Plus 3 FRP Bypass Method or Google Account Lock Bypass Free Solution, How To Bypass Google Verification On OnePlus 3/3T or Unlock FRP/Skip Google Gmail Id, OnePlus 3 A3003 Bypass Google Account Remove FRP Lock 2018, OnePlus 3/3T Frp Bypass/Remove/Reset New Method 2018 - Then Get All These Solutions In One Place Here In This FRP Unlock Tutorial. 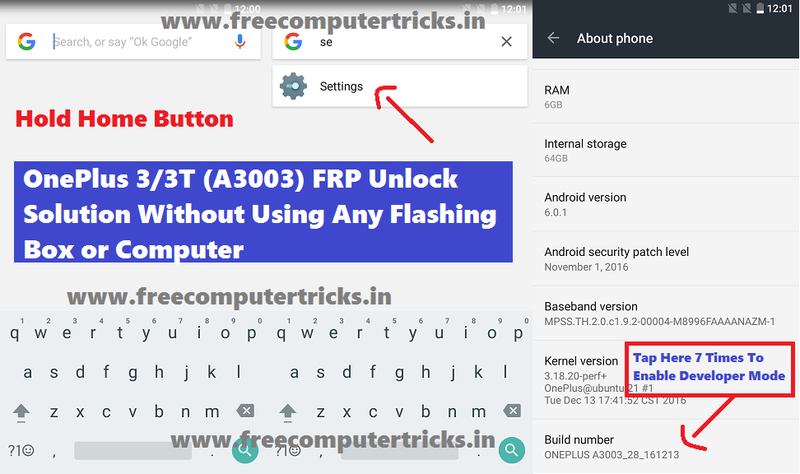 In this article you will know hot to bypass or remove frp lock on OnePlus 3/3T without using Computer or any other mobile flash tools. This is an easy process to unlock frp lock on Android 6.0 smartphone. Unlock frp lock on OnePlus smart phone for the mode OnePlus 3 using the phone itself no need to use Computer and Internet connection. Please go through the below steps. Switch on the phone when you see Wi-Fi connection page stop there. Now press and hold Home button until it opens Google App Search. Now Type Settings, just below you will see the Phone "Settings" Click on it. Now go to About Phone and scroll down to "Build Number" and continuously tap on it until it shows now you are Developer. Now come back and you will see Developer Options just above the "About Phone" Open it. Then enable OEM Unlock and click OK.
Now go to backup and reset and click on reset all. You can also this method to unlock frp lock on Oneplus A3003 and this solution is 100% working, in this frp unlock method you also do not need any Computer or Mobile Flashing Box or Internet connection, just do it on the phone itself, please follow the below process. Now you will see Setup Home tab 2-3 times on it. Then Restart the phone and now you will see the home screen and it will not ask for re-verification. But to complete remove the Factory Reset Protection follow the below steps. Then Go to Developer Settings and enable OEM Unlock. Now go to Backup and Reset and do Reset All. Now you have successfully remove the frp lock on the OnuPlus 3 Android smartphone. All these tow methods are tested and 100% working solution for bypass frp lock. In the same way you can also unlock frp of this phone having Android 7.0. Note: This topic is only for Tutorial purpose, if you misuse/illegally use this tutorial the risk should be completely belongs to you. Apply this method to unlock frp lock if the phone is completely yours and in case you forgot the Email id and password.